An important open problem in the area of Traitor Tracing is designing a scheme with constant expansion of the size of keys (users’ keys and the encryption key) and of the size of ciphertexts with respect to the size of the plaintext. This problem is known from the introduction of Traitor Tracing by Chor, Fiat and Naor. We refer to such schemes as traitor tracing with constant transmission rate. Here we present a general methodology and two protocol constructions that result in the first two public-key traitor tracing schemes with constant transmission rate in settings where plaintexts can be calibrated to be sufficiently large. Our starting point is the notion of “copyrighted function” which was presented by Naccache, Shamir and Stern. 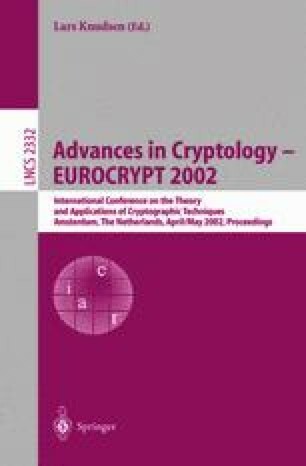 We first solve the open problem of discrete-log-based and public-key-based “copyrighted function.” Then, we observe the simple yet crucial relation between (public-key) copyrighted encryption and (public-key) traitor tracing, which we exploit by introducing a generic design paradigm for designing constant transmission rate traitor tracing schemes based on copyrighted encryption functions. Our first scheme achieves the same expansion efficiency as regular ElGamal encryption. The second scheme introduces only a slightly larger (constant) overhead, however, it additionally achieves efficient black-box traitor tracing (against any pirate construction).